When Virginia’s Justin Anderson went down with an injury late in the 2014-’15 season, the Cavaliers’ offense collapsed. In the 12 games without Anderson, Virginia lost more games (3) than they had the entire season up to that point (1). 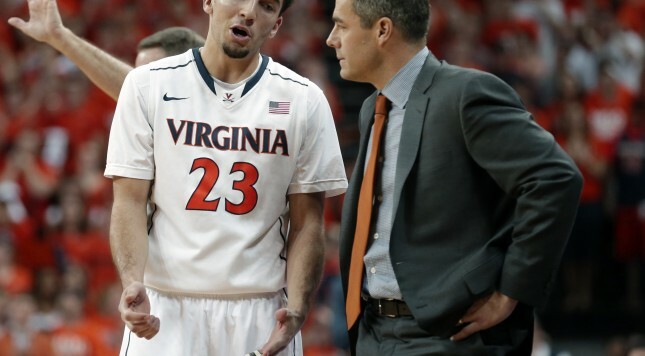 Furthermore, Virginia scored over a point per possession just five times in those 12 games. Because of that, I did not have high hopes for Virginia this season. So far, the Cavaliers have proven me wrong. Virginia is 7th nationally in KenPom’s adjusted offensive efficiency, and has scored over a point per possession in all eight of its wins. The defense has been very good, per usual, but for the first time it could be Tony Bennett’s offense that saves the day. But how? The most important point is Virginia flatly refuses to turn the ball over. The Cavaliers are turning it over on fewer than 14 percent of their offensive possessions, which is third best nationally. Having a junior-senior backcourt in London Perrantes and Malcolm Brogdon sure helps in that regard, but even moreso it’s that even the non ballhandlers take care of the ball. Anthony Gill, who stands at 6-8, has just a 7 percent turnover rate. Mike Tobey (7-0) has a turnover rate of 7.7 percent, Devon Hall (6-5) has a turnover rate of 9.9 percent, and Isaiah Wilkins (6-7) has a turnover rate of just 8.2 percent. All coaches prioritize taking care of the ball, so this point is a little obvious, but it really seems like Bennett is prioritizing it this year. Case in point, freshman Jack Salt, who is shooting 57 percent and is the team’s best offensive rebounder, is playing just 10 or so minutes per game because he has by far the worst turnover rate on the team. Some of it is obviously youth, but Bennett seems to be sending a message that if you turn it over, you’re not playing, no matter how else you can help. Another key is the improvement of London Perrantes. Former Grantlander Mark Titus criticized Perrantes earlier this season, but those criticisms are unwarranted. Perrantes has improved to a 133 offensive rating, is shooting 52 percent on twos, 54 percent on threes, and has an assist rate over 30 percent with a turnover rate under 20 percent. It is fair to mention that he played poorly against Virginia’s two toughest opponents thus far, but with his improvement and the strong play of Gill and Brogdon, it looks like Virginia will have enough offense to make people forget that Tony Bennett is one of the best defensive coaches in the country. That defense only figures to get better as well. Virginia is allowing an uncharacteristically high number of field goal attempts at the rim this season, which has translated to the Cavaliers allowing opponents to shoot 46 percent on twos. That number is better than the national average, but a far cry from the 40.1 percent mark they allowed last season. Some of it is probably the emphasis on defensive contact, so Virginia will adjust and get even better defensively as the year goes along. That’s a scary proposition for its opponents, and I can now add one more national title contender to my list.